IMHO, peplum tops are very flattering, so I had to take this Vogue pattern for a test run. The last peplum top I made was from a Burda WOF pattern and I wear it quite often. I made it before I started blogging, but it was my first review on Pattern Review if you are interested. This Vogue top will get just as much wear as the Burda peplum. 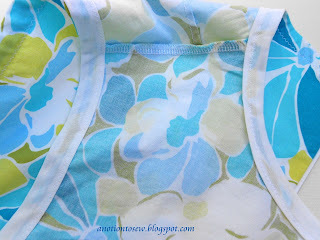 I really like the match up of this stretch sateen fabric from my stash along with this pattern. The fit is close-fitting and you would not want this to have a lot of wearing ease as it would alter the style lines of the top. Therefore, the small amount of stretch in this sateen fabric works beautifully. 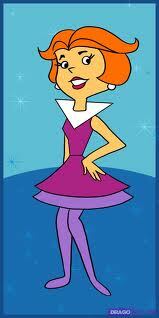 Yes, dear readers, it's Jane Jetson! See the resemblence? The back closure uses a 22" invisible zipper. And the armhole and neckline openings are finished with bias tape. I used my serger on all other exposed seams. I did not make any adjustments to the pattern and I did not make a fit muslin. I simply cut it to match my upper bust measurement and it was a perfect fit right out of the envelope. If you're wanting to stay on trend this season and make yourself a peplum top, this would be a great pattern to choose. I like that top on you.